Like many other hospitality occupations, bartending is a job that requires a person to have certain traits to be a good fit. Sans those traits, it can be an ill fit. Knowing what to expect in the bartending environment can also help you prepare for this line of work, whether you intend to do it as a means of short-term employment or as a career. Consider the following insights before choosing to bartend. 1. Bartending is a socially intensive occupation. To bartend successfully, you will need to learn the art of geniality. Simple deeds or gestures like smiling, displaying enthusiasm, welcoming a customer and thanking them for their business can make a lasting, positive impression. 2. Bartending requires an unshakable positive attitude. A consistently positive attitude is essential, regardless of how awful of a day you might be experiencing. Similarly, you will need to maintain a positive attitude when dealing with rambunctious and, sometimes, inebriated patrons. 3. Establishing boundaries is inherently part of your duties. The skill of discernment is crucial for bartending, and it will help you set limits. For instance, you will need to set social boundaries, such as refraining from getting involved romantically with customers, abstaining from drinking on the job or refraining from disclosing deep details about yourself to patrons. Similarly, although you want to be cordial, you do not want to be overly nice. 4. A good memory is one of the keys to success. A sharp memory is a marked advantage in bartending. From retaining multiple drink orders and associating drinks to faces to recalling drink blends and remembering preferred drinks and names of your regulars, a good memory will help you stay organized at a favorable tempo. 5. Cleanliness is an ally. Maintaining a hygienic workplace is a prerequisite for any business that serves food and beverage. Patrons are hygienic-conscious, and most will not return if your bar is untidy. Dirty bar towels, unsightly drink spills, dirty hands, murky glasses and food remnants are a no-go. 6. Prepare to toil during wee hours. Bartenders tend to work all night and sleep in all day. Las Vegas might be an exception as many bars are open 24/7. Otherwise, you will likely be on your feet until dawn if you work at an active venue. Notably, bartending work shifts do vary based on alcohol-serving regulations in your county or state. 7. Friends and foes alike will expect free or discounted drinks. Expect people from your past, present and possibly future to drop by seeking a freebie or a deal on drinks. Some establishments might be lenient and offer discount for friends and family. However, breaking the rules is never advisable. 8. 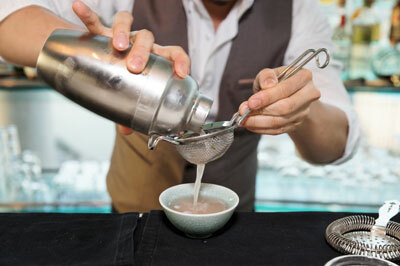 Several types of bartending job settings exist. From tending bar at Michelin three-star-rated restaurants and golf clubs to local taverns, casinos and nightclubs, venue options can vary drastically. Select a setting that best suits your style. 9. Alcohol will pervade your workplace. For people who lack self-control or abuse alcohol, bartending is a high-risk vocation. Addictive personalities will also want to exercise caution. 10. Bartending can be lonesome. Although bartending offers unceasing opportunities for socializing, most of the socializing is superficial. Also of note, your schedule may not allow you to socialize with friends as you did before. 11. Bartending requires study, practice and deliberation. Contrary to popular belief, bartending requires knowledge, including mixology skills equipment familiarity, basic liquor law understanding and customer relation skills. Patrons can often distinguish between a pro bartender and a mediocre bartender. Fortunately, you can fine tune or acquire the necessary skills through bartending schools, online certifications and in-house training. 12. The environment can be antagonistic or uncomfortable. Although bouncers can help quell or defuse situations, unpleasant events are inevitable. Belligerent customers can threaten you, swear at you or make unwanted advances. Hence, an even-keeled, tough-skinned temperament is helpful. 13. Earnings can be plentiful and at other times, miniscule. Your paycheck and tips can fluctuate drastically. As such, you must learn to manage your money well. This might also include obtaining your own health and dental insurance because bartender jobs usually do not offer benefits. 14. Bartending is a flexible job but can be a limiting career choice. One of the great allures to bartending is that a long-term commitment is optional. An hourly wage coupled with tips might suffice to a 22-year-old with few bills. However, for the 35-year-old with a family, mortgage and car note, bartending might not be as alluring because a promotion to hospitality manager at a luxury hotel might prove elusive or take too long. 15. Do not romanticize bartending. You might find bartending satisfying, encounter amazing folks and hear entertaining stories. Still, the job requires you to work hard, from stocking the bar, checking IDs and cleaning stations to darting around and fetching drinks. Bartending is a uniquely rewarding job for many people. Nonetheless, as with any line of work, it helps to know what a job is like before committing.